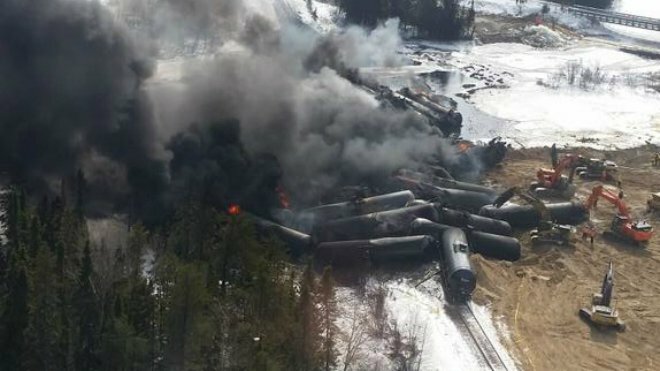 It’s almost impossible to keep track of the number of reported Canadian National Railway derailments. Early this morning, another CN derailment occurred in northern Ontario, this time about 100 km north of Sudbury and about 3 km from Gogama (CTV News, Sudbury Northern Life, Toronto Star, Sudbury Northern Life ). 30 to 40 tank cars loaded with crude oil fell off CN’s mainline tracks, at least 5 caught fire, and others tumbled into the Mattagami River. The media were initially told that only 10 cars had derailed. Today’s derailment is only 37 km from the site of another CN oil train derailment on February 14, 2015. Residents in nearby Gogama have been told to stay indoors, and Mattagami First Nations members have been told to avoid drinking water from the community source because an undisclosed volume of crude oil has spilled into the adjacent waterway. The local health unit has advised people who take water directly from Minisinakwa Lake, or from wells supplied by the river, not to use that water for drinking or cooking until further notice. The local fire department recommended anybody with breathing problems to stay indoors until further notice because particles in the smoke might be dangerous. A section of the main highway connecting Timmins with southern Ontario has been closed. An emergency response plan has been activated with local officials. The extent of environmental damage has not yet been determined; however, booms have been deployed in an attempt to contain the spilled oil in local waterways. The CN train was transporting crude oil from Alberta to eastern Canada. Via Rail has cancelled travel along the mainline. CN confirmed the oil was being shipped in tank cars built to the newer CPC-1232 standard which have enhancements that were supposed to make them less vulnerable to puncture. The Transportation Safety Board (TSB) of Canada has already indicated the newer tank car model has performed similarly during derailments to the older DOT-111 tank car model and is really no safer. The newer model tank cars have also punctured in several other recent derailments. This most recent derailment, is the fifth CN derailment reported so far in Ontario in 2015. 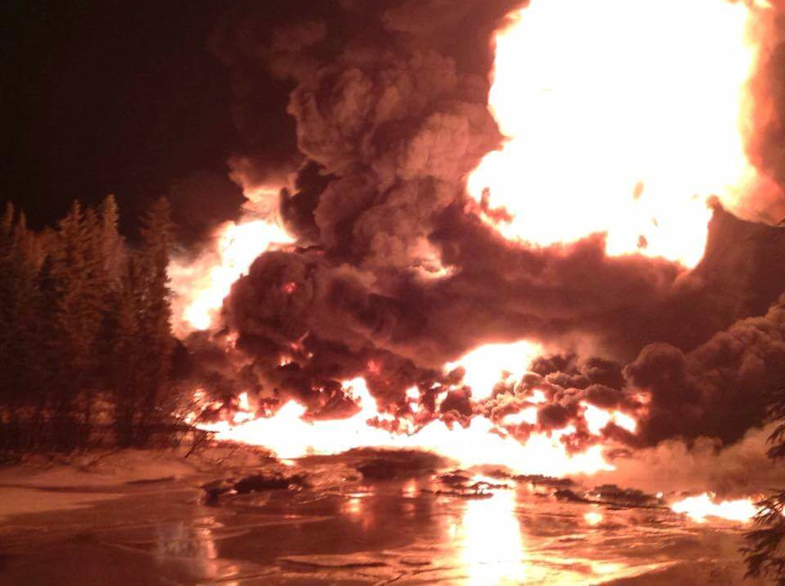 On March 5, 16 CN tank cars loaded with crude oil or gasoline residue derailed east of Hornepayne. 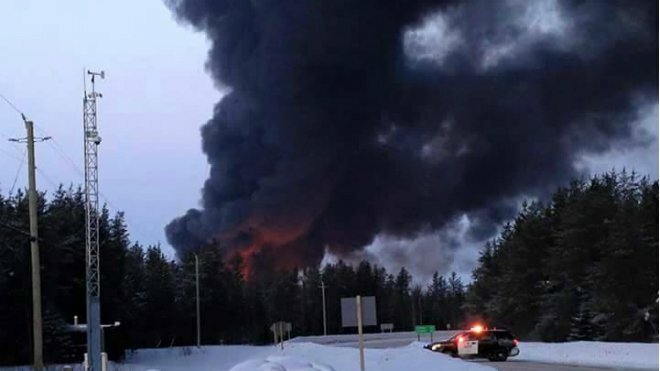 29 tank cars loaded with crude oil derailed February 14 near Timmins and 7 cars burned for almost a week. On January 31, 2 CN cars derailed in Richmond Hill – 1 was loaded with hazardous sulphuric acid and 1 was carrying steel. 4 CN grain cars fell off the tracks inside a Thunder Bay rail yard on January 9, damaging the track. Rounding out the number of CN derailments reported so far in 2015, are 3 in Alberta (1 near Conklin, 1 in Jasper, 1 near Jarrow); 1 in downtown Winnipeg; 1 in the Mont-Joli region of Quebec; 1 in Butler County, Pennsylvania; and 1 northwest of Duluth, Minnesota. Read CN Railway Derailments, Other Accidents and Incidents for hundreds of examples of additional CN derailments in Canada and the United States. It’s important to note that CN does not report all of its derailments. See this link for more information on the many hazards associated with shipping oil and other dangerous goods by rail. ~ by railroaded on March 7, 2015.